How many times have you rushed into the public bathroom at work with an emergency… situation only to find that either a.) The toilet seat cover dispenser is empty in the stall you chose, or b.) The toilet seat cover you placed on the seat and hurriedly attempted to sit down on fell into the toilet before you made contact? Sadly, this is a story told often by many public restroom users of all kinds, but one that should never have to be told again – not with automatic toilet seat covers on the market, that is. What is an Automatic Toilet Seat Cover? We’re glad you asked. If you’re a business owner, or some other public service entity, the answer to this question may be very interesting to you in particular. If making your employees and customers as comfortable as possible is important to you, the automatic toilet seat cover dispenser might be for you. 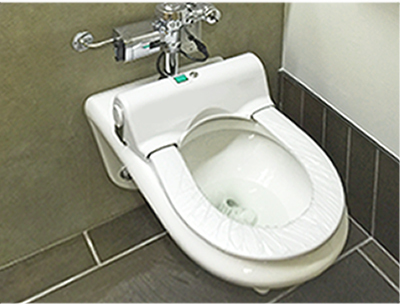 The automatic toilet seat cover is a new technology designed to give bathroom users a clean, sanitary seat to sit on each and every time they use the toilet. This hands-free system engages automatically when someone waves their hand in front of the wall-mounted sensor above the toilet. The old, used seat cover winds up onto a roll on one side as a new, clean, sanitized cover takes its place from the other sode. You never have to touch the covers or the toilet seat itself. When compared to traditional paper toilet seat covers, the hands free automatic toilet seat cover is far and away superior. The main advantage is the fact that you never have to touch any germy surface. Old seat covers remove themselves, and the new ones take their place with a wave of the hand. The second biggest advantage over their paper counterparts is the fact that this touchless toilet seat cover dispenser releases a plastic cover that does not let liquids seep through. While the idea of any seat cover is a good one, knowing that you don’t have to worry that urine, feces or toilet water on the seat is going to soak through the thin paper is a huge relief. Aside from these great benefits, here are a few more. Fewer janitorial and maintenance costs – Having a quality automatic toilet seat cover system in place in your public bathrooms decreases the need for janitorial services and maintenance calls. There is less mess caused by excess toilet paper usage to cover the toilet seats, and you won’t need to call a plumber as often to open clogged toilets. The seat cover dispenser for toilets makes the bathrooms look better –As mentioned in the last benefit, there will be less mess on the floors as your employees and customers won’t need to use excess amounts of toilet paper to cover the toilet seats. Improved customer and employee satisfaction – When you serve the public, customer satisfaction is important. Any way you can make them happy is good, and a clean, sanitary bathroom ranks high. Install an automatic seat cover dispenser for restrooms and watch how many positive comments you get from both customer and employee. If you haven’t thought much about how the bathrooms in your business can and do affect your employees and customers, now’s the time to consider installing an inexpensive toilet seat cover dispenser in each stall. The bathrooms may not be a priority, but they should be. Many people dread using public bathrooms, and by making their experience a sanitary one, you might just create a more pleasant workplace for your employees and create relationships with your customers that last a lifetime. To learn more about this great bathroom technology, or to find the best automatic toilet seat cover dispenser on the market, visit BrillSeat.com. Our expert staff is on hand to help you make your bathrooms a pleasure to use. When people see that you’ve installed the Brill sanitary toilet seat cover system, they know you care about their well-being and good health.